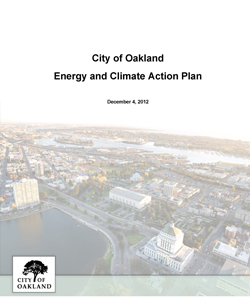 The Oakland Energy and Climate Action Plan (ECAP) was adopted by the City Council on December 4, 2012. The City and its partners throughout the community have made significant implementation progress on priority actions identified in the ECAP. View the November 2012 ECAP Implementation Progress Report. In 2017-18, City staff worked across multiple departments and with green business groups, social justice organizations, and environmental stakeholders to update the ECAP. The timeframe and greenhouse gas reduction goals are unchanged. The revised document reflects actions that have been completed or are fully underway, reprioritized actions, updated cost estimates, and the most recent greenhouse gas emissions inventory. Optimizing our use of energy and minimizing associated energy costs and greenhouse gas (GHG) emissions are important components of Oakland's sustainable city vision. The purpose of the ECAP is to identify and prioritize actions the City can take to reduce energy consumption and GHG emissions associated with Oakland. The ECAP establishes GHG reduction actions, as well as frameworks for coordinating implementation and monitoring and reporting on progress. The ECAP assists the City of Oakland in continuing its legacy of leadership on energy, climate and sustainability issues. For more information about Oakland's Energy and Climate Action Plan, contact the Sustainable Oakland program. On March 1, 2011, City Council adopted Resolution No. 83245 C.M.S., directing staff to perform appropriate review per the California Environmental Quality Act (CEQA) for the draft Energy and Climate Action Plan (ECAP), and upon conclusion of that review return to the City Council for consideration of the CEQA review and final adoption of the ECAP. View the March 1st City Council agenda. Consideration of the draft ECAP is included as Item 9.3. The CEQA process was completed in the form of the ECAP Addendum to Previous CEQA Documents. View the February 22nd Staff report summarizing recent revisions to the draft ECAP. The Draft Energy and Climate Action Plan Appendix is also available for download. The draft ECAP was also considered at a meeting of the Oakland Planning Commission on December 1, 2010, and at a meeting of the Council Public Works Committee on December 14, 2010. The initial draft Oakland Energy and Climate Action Plan (ECAP) was released on Earth Day, April 22nd, 2010. Public comment on the Draft Energy and Climate Action Plan was accepted through June 11, 2010 via email, fax, mail, and two Community Workshops held on May 6, 2010. The Oakland City Council held a Special Workshop from on March 30, 2010, at which City staff provided a presentation to the City Council on Oakland’s energy and climate action planning efforts. In July 2009, the City Council directed staff to develop a draft Oakland Energy and Climate Action Plan (ECAP) using a preliminary planning greenhouse gas (GHG) reduction goal of 36% below 2005 GHG emissions by 2020. At this Special Workshop, Staff provided an update on the ECAP development process and preliminary findings. Download the Staff report and presentation or view a video of the Special Workshop. On July 7, 2009, the Oakland City Council adopted a resolution establishing Oakland's GHG reduction target. Council directed staff to develop the draft Oakland Energy and Climate Action Plan using a preliminary planning GHG reduction target equivalent to 36% below 2005 GHG emissions by 2020, and annual benchmarks for meeting the target. The Staff recommendation and accompanying report for this Council item are available on the City’s website. The City held two second-round public workshops on April 30, 2009 to gather input on potential Oakland energy and climate goals as well as potential actions the City could consider to reduce energy use and greenhouse gas emissions. View a copy of the presentation given by City staff at these workshops. City staff continued to take public input on the same topics covered at the April 30th workshops through Friday, May 8, 2009. Below are links to the worksheets used to gather feedback at the April 30th workshops. The City held two first-round public workshops to provide an overview of the planned ECAP development process and to gather initial input on potential ways of reducing GHG emissions and issues to consider in the process of developing the ECAP. Use the links below to view copies of the presentations given by City staff at these workshops as well as workshop summaries.